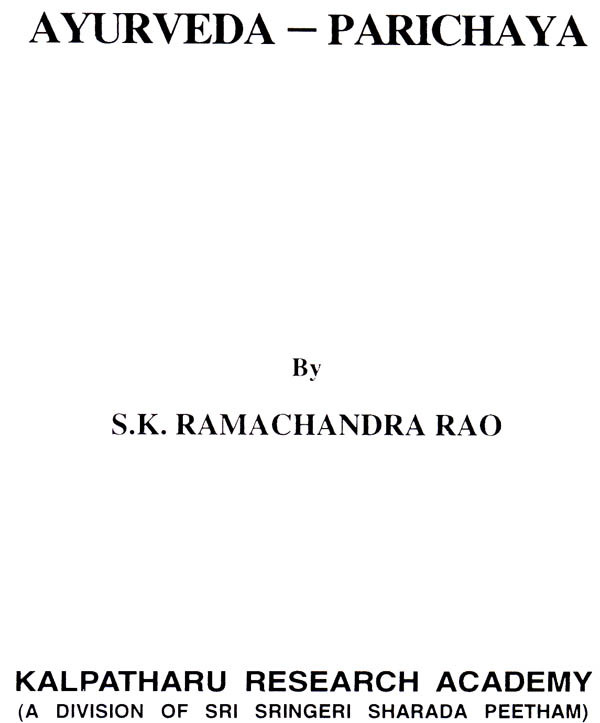 Vidyalankara, Sastra-Chudamani, Sangita-Kalaratna, Professor Saligrama Krishna Ramachandra Rao is a well known scholar who combines traditional learning with modern research. Well versed in Sanskrit, Pali, Ardhamagadhi and several modern Indian languages and acquainted with Tibetan and some European languages, he has written extensively on Vedanta, Buddhism, Jainism, Indian Culture, Art and Literature. In his professional career, however, he was a Professor of Psychology. He has headed the Department of Clinical Psychology in the National Institute of Mental Health and Neuroscience’s, Bangalore, and the Department of Indian Culture in the Collision College Study Center of the University of the Pacific (U.S.A). At present, he is the Senior Associate of National Institute of Advanced Studies (Indian Institute of Science), Bangalore, and Guest Faculty, Indian institute of Management, Bangalore and member of the Governing Council of TTD ISVCL Research Centre), Tirupati. He has been Member of Karnataka State Lalitha Kala Academy and Sangita Nritya Academy; he has served on the Agama Board (Govt. of Karnataka). He is President of Silpa-Kala Pratishtana. The Govt. of Karnataka has honoured him with the 1986 Rajyotsava Award. He has received awards from Lalita-Kala Academi and Sangita Nritya Academi. He is the recipient of the Veda Sanman for the year 2000 by the Govt. of India (H.R.D. Ministry). Kendriya Samskrita Vidya-peetha, Tirupati,(deemed university) has awarded him honoris causa degree ‘Vachaspati’ (2003) He is the recipient of the prestigious Veda-ratna award (2004) from Sri Gangeswarananda Foundation. He has written more than sixty books in Kannada, a play in Sanskrit, and a Pali commentary on a Buddhist classic. One of his books on iconography in Kannada has won the State Sahitya Academi Award, as also another of his books on the Tirupati Temple. He is at present engaged in the 30-volume project Rgveda Darsana Fifteen volumes of which have appeared). He is also a musicologist, a sculptor and painter, and has held some one-man shows. The Kalpatharu Research Academy, Bangalore is an Institution running with the benign blessings of His Holiness Jagadguru Shankaracharya, Sri Sri Sri Bharathi Theertha Mahaswamiji under the auspicious of Dakshinamnaya .Sri Sringeri Sharada Peetham, Established in 1981. Kalpatharu Research Academy has stride across the horizon of Indological Research and Publications with giant steps, and today stands as an Institution known for its unique quality of Research work. Kalpatharu Research Academy is dedicated to the cause of preservation of ancient heritage of India; it has encouraged Research in the fields of Agama, Veda, Tantra, Jyoutisha, Mantra Sastra, Vaastu, Yoga, Silpa, and Ayurveda etc. Among its prestigious publications (numbering more than Hundred till now), are Six Vol’s. of Pratima-Kosha, Twelve Vol’s of Agama-Kosha, Three Vol’s of the Art & Architecture of Indian Temples, Vastu-Silpa-Kosha in three Vol’s, Devata-rupa-mala in Four Vol’s and several Koshas like Ganesha-Kosha, Lalita-Kosha and Navagraha-Kosha, Oshadhi-Kosha, Salagrama-Kosha, Gita-Kosha, Hanumat-Kosha, Vanaspathi Kosha etc. The Academy has plans of undertaking intensive Research in the field of Veda and Vedanga, and intends publishing “Bharatiya-Samskriti-Sarvasva-Kosha” an encyclopedic work in several volumes dealing with all aspects of Indian Tradition & Culture. It seeks to promote Education, Culture, and Science, Art and learning in all its branches. The approach will he broad based and multi disciplinary. An extensive, comprehensive and specialist reference library has been built up to assist the Research Workers in the Indological disciplines. A valuable collection of Palm Leaf manuscripts relating to Veda, Vedanta, Vedanga and allied subjects has already been made: the collection work is continuing. Dakshinamnaya Sri Sringeri Sharada Peetham has been running a Guru-Kula type of Institution on traditional lines to impart Vedic Education at several places. Some of these Institutions are over 100 years old. It is the intention of Kalpatharu Research Academy to take an active part in continuing this age-old tradition and act as the Research & Publication wing for these Institutions. Our ambition is to develop as a National Center for higher learning in Veda, Vedanga and Shastras and facilitate the propagation of unique Sanskrit and Vedic texts in the National and International arena. This Publication is the 113th of its achievement in this field. Kalpatharu Research Academy, Bangalore, proudly presents an introductory volume on Ayurveda, the Indian medical system which has now become subject of worldwide interest. Ayurveda is not only a curative system; it has preventive aspects also which are of great relevance to healthy people as well as sick people. 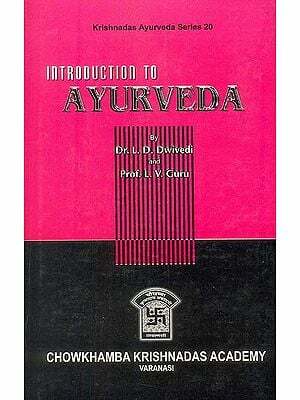 It is this aspect of Ayurveda that is dealt with in this volume. There is no doubt this will be of interest to health oriented populace, besides being of value to disease oriented practitioners. The academy acknowledged the immense contribution being made by Vidyalankara, Sastra-chudamani, vachaspati Prof Dr. S.K. Ramachandra Rao who was for long years president of the Ayurveda Academy. The Academy records its gratitude to the blessings of Jagadguru His Holiness Sri Sri Sri Bharati Tirtha Mahaswamiji, of Sringeri Sharada Peetham, chief patron of the Academy and to the keen interest evinced by Shri V.R. Gowrishankar, Administrator of the Sringeri Sharada Peetham and Chairman of the Academy. We also acknowledge the generous Financial Assistance from the Ministry of Human Resources Development, Department of Education, Govt. of India, New Delhi and Dept. of Education, Govt. of Karnataka, Bangalore. The Academy thanks the staff of the Omkar Offset Printers for neat production of this volume. 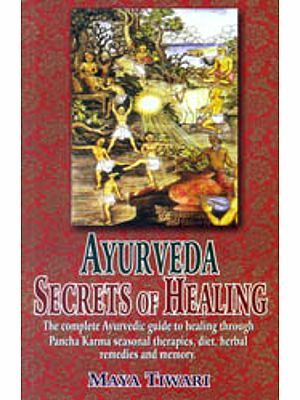 Among the medical systems of the world, Ayurveda is probably the only system that focuses attention on the whole health, bodily, mental, moral and spiritual. It is in every sense of the word holistic. 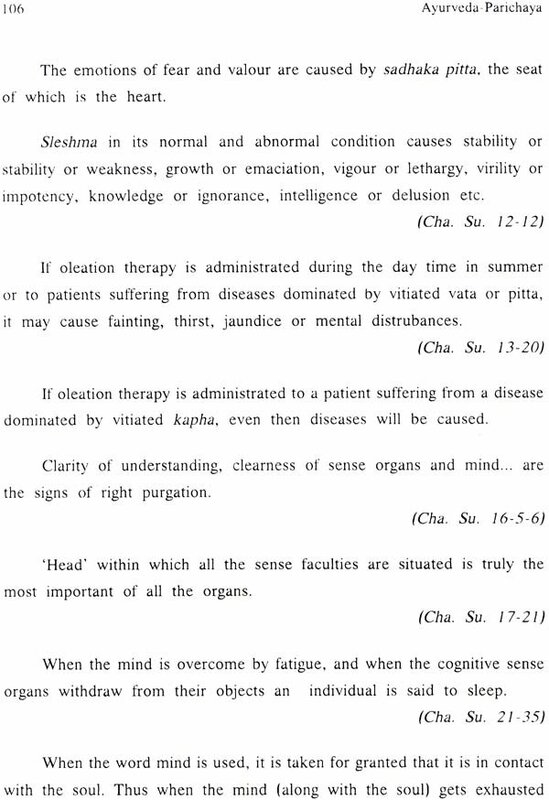 The principles of svastha-vrtta, sadvrtta and rtu-charya are unique aspects of this system. The present volume included in the Bharatiya-Samskriti-Sarvasva-Kosha, deals with fundamental issues tackled in this system. I am indebted to Sri Daivajna K.N. Somayaji, Director and Chief Editor of Kalpatharu Research Academy for including this compilation in the Bharatiya-Samskriti-Sarvasva-Kosha series of the Academy’s publications. I am also indebted to Jagadguru His Holiness Sri Sri Sri Bharathi Theertha Mahaswamiji of Sri Sringeri Sharada Peetham and the chief patron of the Academy, the Administrator of the Peetham Sri V.R. Gowrishankar the Chairman of the Academy. Also I am indebted to my young friend and student Shri Shankar for having kindly helped me with correction of proofs. The printers have done a good job in producing this volume, and I thank them.